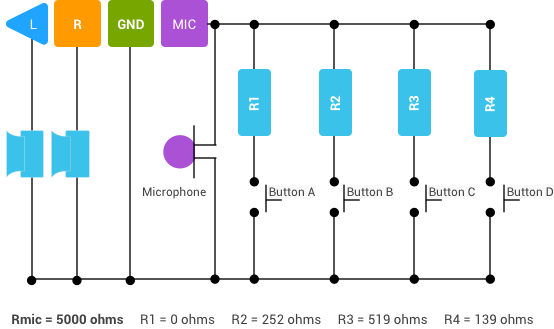 This article specifies requirements for 3.5 mm plug headsets to function uniformly across the Android ecosystem. Device manufacturers should consult the 3.5 mm jack specification and the Android Compatibility Definition Document (CDD) for additional requirements. In the following diagrams, Button A maps to Function A, Button B to Function B, and so on. 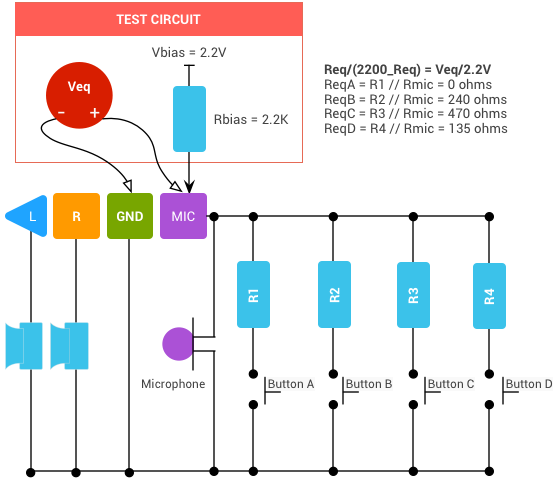 The following diagram for Reference Headset Test Circuit 1 shows the CTIA pinout for a 4-segment plug. For the OMTP pinout, switch the positions of the MIC and GND segments. The following diagram for Reference Headset Test Circuit 2 shows how the actual resistor values (R1 - R4) are altered to meet this specification. Where Rn is the actual resistance of a button, ReqN is the equivalent impedance value of that button (provided), and Rmic is the microphone impedance value. The example above assumes a 5 kohm microphone impedance (Rmic); to achieve an equivalent R4 impedance of 135 ohm (ReqD), the actual resistor value (R4) must be 139 ohms.